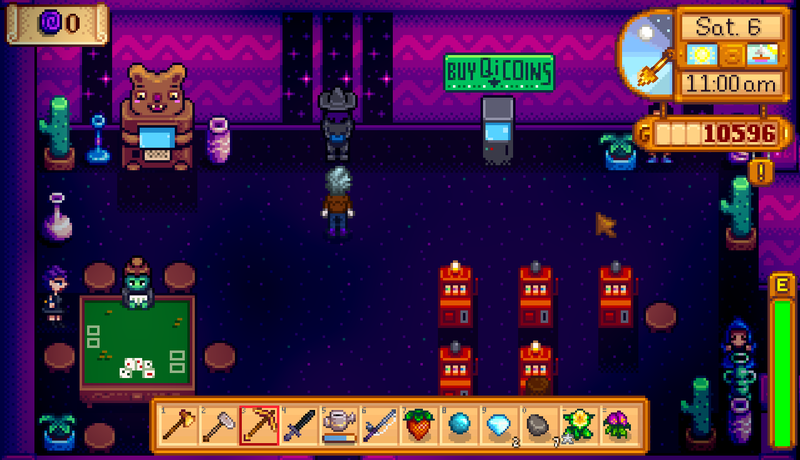 There’s a hint of gambling during one of the festivals in Stardew Valley, but you don’t get into the meat of high-stakes winnings until you find the Casino. Located in the rear of Sandy’s Oasis in the Calico Desert, the Casino is likely one of the last places you’ll unlock - and it’s also one of the stranger locations in the game. Be warned, you can lose a lot of money in here. Also, might be run by aliens. Just postulating. In order to unlock the Casino you must first get a Club Card. This requires completing the quest The Mysterious Qi, which will bring you out to Calico Desert once, perhaps twice. Either way, you need to repair the bus out to the Desert to even consider getting into the Casino. The Casino is open as long as Sandy’s Oasis is open, though once you’re inside you can stay for as long as you like. The Casino has several features which are worthy of note. Like most video game casinos, the Casino of Stardew Valley runs on its own currency: Qi Coins. Named after the Casino’s enigmatic owner, Qi Coins are exchanged at a machine in the Casino at a rate of 100 Qi Coins for 1,000 gold, or 1:10. You need Qi Coins to play the games here, where you can also win more Qi Coins. The primary game of the Casino is CalicoJack. It’s a stripped-down version of Blackjack in which you and the dealer draw cards and try to get to twenty-one points without going over. If you go over twenty-one, you go bust and lose. It’s essentially identical to Blackjack in most respects, the primary difference being that you can only get cards valued higher than nine on your initial draw. There are two tables where you can play CalicoJack. The first, to the left, allows you to bet 100 Qi Coins per game. The same, to the right, allows you to bet 1,000 Qi Coins. What Casino would be complete without slot machines? You can bet either ten or one hundred Qi Coins on a spin of the wheel. Match up with any of the combinations on the right to win big. As simple as that, really. To the left of Mr. Qi you’ll see a bear-shaped computer terminal. This terminal contains a variety of stats on your current character, such as steps taken, gifts given, items crafted, trash recycled, and so forth. Nothing terribly important, but fun. To the right of the Qi Coin dispenser is an odd, shifty-looking fella who offers to sell you a Statue of Endless Fortune. The price? 1,000,000 gold. Yikes. The Statue is worth the cost, however, as it will dispense items to you on the birthdays of NPCs - and the items will be favourites of those same NPCs. Costly, but a nice, swift way to quickly build up affection values. The most important thing is that online casino will let you play free, in a land-based casino you can't enter and play practice games before you start betting any real money,http://www.getinternetcasinos.com/ but at online casino. Take part in online gaming forums where you can learn from experienced players. As the saying goes,click to find out more "Idiots learn from their own mistakes; wise men learn from the mistakes of others. They will likewise guarantee the players security and decline to pitch data to outsiders. These instructional assets ought to give essential poker guidance in addition to data on further developed poker technique and strategies. This was practiced in light of the Absolute Poker outrage wherein a player, utilizing inside data, overwhelmed a $1000 purchase in competition and won each and every deliver the competition aside from the initial two.